The PGA Tour Canada is one of many men’s professional golf tours currently operating around the world. In this article, we’ll take a more in-depth look at the Tour, its history and its different competitions. PGA Tour Canada was first started in 1970, when it was known as the Peter Jackson Tour after its sponsor. In 1986, it became the Canadian Professional Golf Tour before the US PGA Tour bought it out in 2012 and gave it its current name and format. The original tour comprised around eight tournaments per season, with the winner of each event taking home around $25,000. As well as the top Canadian golfers, such as PGA Tour winners Al Balding and George Knudson, the tour also attracted star names from across the world in its early years. After 1986, more and more players from the United States and Europe began to play on the Canadian Tour – much of this was down to the events being upgraded from 36 or 54 holes to a full 72-hole, four-day-long, event. Perhaps the most famous player who originated on the Canadian tour is Mike Weir, who won the 2003 Masters to become the only Canadian – and only the second left-handed golfer at the time – to win a Major championship. Major winners Michael Campbell and Todd Hamilton have also featured in Canadian Tour events, as have Ryder Cup mainstays Steve Stricker, Chris DiMarco and Paul Casey. While the US PGA Tour is the target for all professional golfers, many from around the world are now using the Canadian Tour as a springboard for further success in North America. In 2011, The Canadian Tour became the first men’s professional golf tour to offer a scorecard to a woman when Isabelle Beisiegel from Quebec entered a number of events. However, she lost her card after failing to make the cut in any of the tournaments she competed in. The Canadian Open is the most famous golfing event held in Canada and the one with the largest amount of prize money offered to the winning golfer. It is held on rotating courses and the 2018 version of the event was won by American Dustin Johnson, after two consecutive victories for the Colombian Jhonattan Vegas. Other events on the PGA Tour in Canada include the Freedom 55 Financial Open, Bayview Place DCBank Open, GolfBC Championship, Lethbridge Paradise Canyon Open, Windsor Championship, Staal Foundation Open, Osprey Valley Open, the Syncrude Oil Country Championship, ATB Financial Classic, The Players Cup, the Cape Breton Open and the Mackenzie Investments Open. 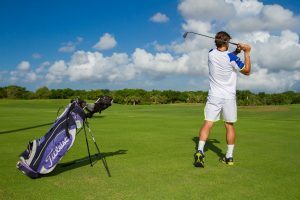 There is also the tour-closing Go Vacaciones Cozumel Cup, which is a team event, where Canadian golfers are pitted against those from Latin America.